I’m back and with some big news! I now have GTA 5’s new downloadable content which is called the After Hours update. This is the latest piece of content that Rockstar has released for the online portion of this very popular game. This appears to be a little bit of a different take on things in regard to what Rockstar normally releases, but once you delve into all the aspects of this new content, you’ll get to see how this works and ties into all the other pieces of content the developer has released in the past especially when it comes to your illegal business enterprises. Now that I have the After Hours update installed, it’s time to get involved with it. As with other updates and content releases that came before, I have to buy some property in order to engage in it. It’s time for me to spend a nice chunk of change once again, but I’m not too worried about that since I do have a decent amount of funds. The first thing I need to do is go to the in game web browser and go to the Maze Bank foreclosure website to see what sites/buildings are available for purchase. There are a number of them spread out across the city of Los Santos and so it is a little difficult to decide which site would be a good location for me. There’s one that’s very close to my headquarters of my CEO operations and that’s one that I do heavily consider at first, but I end up deciding that I don’t want one that close to another piece of my business enterprises so I start to look at other locations. The nightclub that I end up choosing is known as the Strawberry Nightclub (don’t worry, it will have a different name) and it’s actually really close to my high end apartment in downtown Los Santos, it just happens to be south of the freeway by some warehouses. You’re probably wondering how much it will cost me. 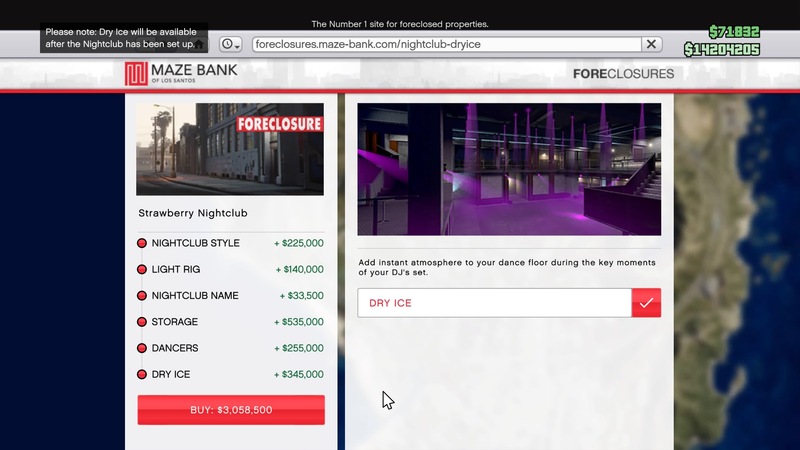 Without adding anything it runs around $1.6 million, however, I add certain things to it such as the nightclub style, light rig, nightclub name, storage, dancers, and what is known as dry ice. That ends up bring the total to $3,058,500 dollars. As I mentioned earlier, I have more than enough to purchase it as my total was $14 million before the purchase. Now that I have the building my nightclub will be in, it’s time to start setting it all up. It’s time for me to head to my own nightclub and get it ready for business. I was at Fort Zancudo when I ended up purchasing that building and so I have to drive all the way there which I don’t mind as I like the scenery. Once I’m there, I enter the building and see the interior where things being unpacked and getting ready to be setup. There’s also someone talking as soon as I step in, but I realize that voice sounds very familiar. If anyone has played the single player portion of GTA 5 and done the missions, you’ll definitely recognize the voice as it is none other than Lazlow himself. Lazlow seems to be practicing for a live opening of some kind and shouts out all kinds of stuff. As my character walks through the building and towards Lazlow, he mentions to a person named Tony that his friend is here (which is of course me). This person is known as Gay Tony which if you’ve played GTA IV, you’ll know that he was a part of that game via downloadable content. Tony tells Lazlow to pretty much cool it as this is a nightclub and not a television show. After Tony tells Lazlow start getting a guest list pretty much, Tony starts showing me around the place showing where the computer room is to run things and my storage room which I can store things from my other businesses that I will more than likely want to run out of this nightclub. When Tony finishes giving me the tour of the place, another person walks in with whom you can tell is from Europe, more than likely from England based on his accent. He goes by the name of Dave and he specializes in getting musically inclined artists or DJs into clubs who will bring in great crowds of people. After that introduction, it’s now time to head to my office computer and start truly setting up my nightclub which goes by the game of Galaxy. Oh yeah, one other thing that I forgot to mention is that my nightclub has a large garage and so I can store more of my vehicles in here. Something else I want to mention is that my private office is actually shared with Tony as he has his own space for his computer across from mine. Now just like the Gunrunning and the Doomsday Heist, I have to register as a CEO in order to access the computer and start setting things up. As I mentioned in some of my previous posts, I don’t have to drive to my CEO headquarters anymore to register as one and I can just do it from a specific menu screen. After that’s done, I’m now able to log into the computer and see that I have two choice on how to start setting up the Galaxy nightclub. I can choose from either setting up staff or setting up equipment and I end up choosing equipment. Once I make my selection, I spawn outside the building and by my motorcycle and then I get a call from Tony who tells me to head out into the desert in order to retrieve a crazy sounds system that has wheels from these unusual festival goers. It’s a little bit of a drive as I have to go out into Blaine County to retrieve the sound system. Tony warns me not to kill anyone if possible and usually that’s a sign to me to prepare for battle. Surprisingly though, I actually don’t have to do that on this mission as it proves to be a bit easier than I thought especially compared to craziness I had to deal with in one of the setup missions for the Doomsday Heist. I finally arrive at my destination and sure enough, there’s a festival going on and there’s a very large sound system that’s on a platform on top of a bus. I’m able to just walk up to it and get in and start to drive off. The people start yelling and run off, but someone starts firing guns at me. I’m not worried though as I’m able to successfully drive away. Driving this thing back to the city turns out to be tedious, because it does not go very fast. The sound system on the platform has different colored lights as well as a large colorful skull attached which makes this thing kind of tall. As I get onto the highway and head back towards Los Santos, things start to get a little problematic. I try to drive under a freeway sign, but sadly the skull is not able to make it under and it falls off. Nothing I can really do about that and I continue driving to my destination. Things get a little more difficult when I arrive in the city because the sound system is pretty tall and I’m not able to go under traffic lights without knocking them down. Also, trying to drive under some underpasses does not work out too well as the speakers won’t fully fit through there and I actually lose a couple of them. Surprisingly though, I’m able to complete and pass this mission with what little I had life. I’m not going to complain and I’m ready to continue setting up the nightclub. Tony says I need to get staff for the club and says for me to get on the computer and start the process for making that happen. Once I log on, the only thing left to choose and is Staff and so I click on it and begin the mission. Once I spawn outside the building, there’s a car I can use which will be needed for this mission and my motorcycle is way out in the desert anyway. 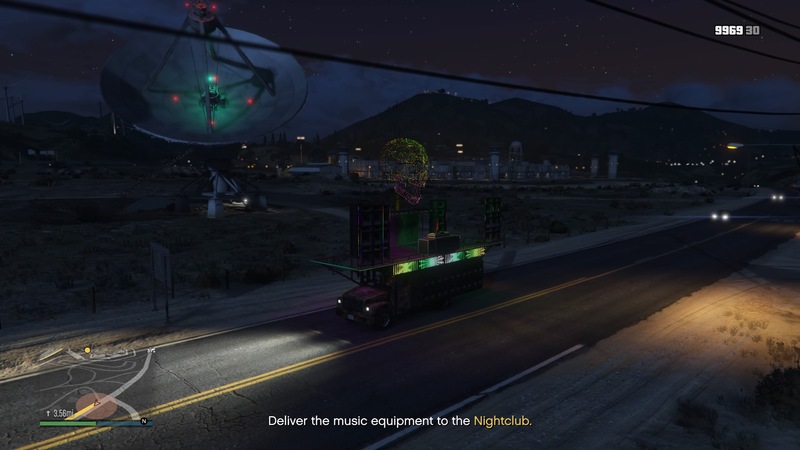 Tony quickly contacts me and said I need to pick up people scattered across the map and bring them back to the nightclub. I’m getting people for a head bartender, head of security, and more so we can get this nightclub running properly. After checking the map, I notice that there’s not one very from me and so I select that person’s location first and head that way as that person is in the downtown area of Los Santos. So far it’s pretty easy as I just have to pull up to where they are and, honk, and then that person comes walking up and gets in the vehicle. The first person I pick up is who will be the Head Bouncer at my club and that he mentions to me that it’ll be a pleasure working with me especially since Tony is here in Los Santos and will be helping out. After he’s in the car, I choose my next location which is in the wealthier part of Los Santos and this person will be the Warehouse Technician. Once I pick him up, Tony calls and lets me know what he does which is to help facilitate my businesses and run them through the warehouse/storage at the Galaxy. The last person that I have to pick up is actually on the beach so I have to drive way out there. This person will be the Head Bartender at the Galaxy nightclub. Now that I’ve collected all the people who be a major part of my staff, it’s time to bring them back to the club. With missions like these, I always suspect that I’m going to be chased down by gun-toting enemies who want to disrupt my mission. Since this is for a nightclub though and nothing involving guns, Doomsday, or smuggling things by plane, I’ve actually got a smooth ride all the way back to my destination. Now that I’m back at the club, Tony tells me to look at the Galaxy sign inside and asks if it’s beautiful. Lazlow of course has to interject with his comments and Tony gets frustrated at him. He warns Lazlow that he will not be DJing in any capacity. A little later on, it’s mentioned that I have to go pick up someone who is coming in from Europe and I have to drive to Los Santos International Airport. I suspect this will be another easy mission, but I’ll be in for a little bit of a surprise when I get there. This person’s name is Solomun and he’s well-known from Tony’s friend (Dave) who’s riding with me on the way to the airport. Suddenly he tells me that he gets another call and it’s from Solomun himself. He says that the plane has missed the runway because the pilot has passed out. Tony’s friend tells Solomun to get into the cockpit and do something. There’s a cut scene showing Solomun in the cockpit and getting some control of the plane. Dave warns me to follow the jet as quickly as possible and tells me to start making my way to downtown Los Santos. I can see the private jet in the distance especially with the smoke trailing behind it. I drive as fast as I can to try to keep up with him or at least keep him in my sights. I finally make my way to the downtown area, but the plane is still up in the air and Dave tells me to get on the freeway as the plane is now headed out of the city. Solomun tells Dave that he’s going to try to land the plane at a small and private airport and Dave thinks he’s crazy. As I’m blazing down the highway, I still have the plane in my sights and Dave mentions that’s going for the airfield in Sandy Shores. As I get closer to the airfield, Dave mentions that Solomun was able to successfully land the plane and that I just need to drive onto the runway and pick him up. After that’s done, all I need to do now is to bring him back to Galaxy. The rest of the mission is smooth from here on out. Once I arrive at the club, I see that things are finally ready to go! Everything is set up, people are there ready to dance and drink and Lazlow kicks things off by introducing Solomun who is the main DJ of my club. Once the music gets going, there are popups on the screen letting me know that I can get my character to dance, by pressing certain buttons. I do give it a try for a little bit, but it’s clear that I need some practice and that’s something I will work on another time. As I’ve mentioned earlier, the Galaxy will also act as a front for my other more illegal businesses. Now I do have a video you’ll be able to see below that shows everything I talked about above, but one thing that’s not in the video is Tony letting me know that I need to get things setup in the warehouse for my businesses to start going through that location. That’s probably going to be my next task as I’m very curious to see how all of this works. I think it will actually be nice to have my Gunrunning and CEO activities all going through a more central location instead of having to deal with all of them at separate locations across the map. I’m not sure if the Smuggler’s Run update will work well through my club considering planes are needed to smuggle contraband across the map, but I’ll certainly find out soon enough. Now that you’ve read my first experience with GTA 5’s newest downloadable content, you should definitely give it a try if you haven’t already. If by any chance you don’t have Grand Theft Auto 5 already and really want to try out the After Hours update as well as all the other great content that the online portion offers, click the link below to get the game at a great price! Click here if you want to get GTA 5 for a low price and get access to the After Hours Update! 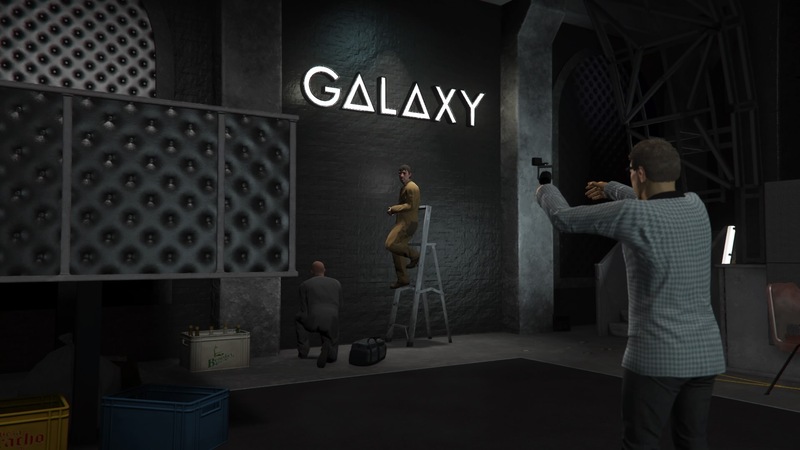 I will certainly be back with more updates as I delve further into the After Hours update and get my other businesses up and running through my club, the Galaxy. In the mean time, check out the video below of my experience that I talked about above. It is a long video, but you’ll know exactly what to expect when you first try out the new content. As always, post your comments and thoughts about the update and maybe what you’ve experienced with it if you’ve already given it a try. Has it become a very profitable experience for you yet? Strawberry Nightclub for ftw! Omg this update is to die for, I’ve always wanted to try own a nightclub ever since I saw Arrow where his sister Thea run a Nightclub on top of their base. Awesomesauce! I’m really liking the After Hours update so far and can’t wait to further into it. I love IGN, but had never really considered that as far as guest posting. Something I shall definitely consider for the future. Thanks for sharing your thoughts! I’m always behind with the content in GTA 5, every time there’s a new update I don’t have enough to buy the new facilities nor do I even want to make any efforts to. The last thing I bought was the bunkers but I never even used it. I always get so sad at how much it costs to buy the new facilities and how long it takes to rake up the money. But owning a nightclub sounds pretty cool too so I guess I’ll just buy that instead of buying an X80 proto. Ty, I tend to agree with you in that facilities and a lot of other things in the game cost quite a bit of money. I’ll admit that I’ve bought some shark cards in the past just so I can have enough to get some of the things I really wanted, but I’ve stayed away from them for awhile now. It is getting a little easier to earn money, especially big money faster, but it still takes awhile at times. I’m curious to see how much money the nightclub will bring in. Brian on Video Game Black Friday Deals!